Chicago, IL: Harri, the end-to-end human capital management solution designed for the unique needs of the hospitality industry, will showcase its revolutionary platform and unveil its latest product at the largest annual gathering of the restaurant, foodservice, and hospitality industry, the NRA Show, in Chicago May 20-23, at booth #7077. As it becomes increasingly expensive to find, retain, and manage staff, Harri reduces overall labor management costs by ensuring clients get the right people in the right roles and maximizing their employees’ performance and efficiency. With Harri’s mobile-first, cloud-based platform, they’ve enabled major hospitality brands to attract the best talent for their business needs while eliminating paperwork using their digital onboarding process and reducing time-to-hire and hiring costs by 68% and 48%, respectively. Harri’s revolutionary new labor management tool, TeamLive, was designed to provide value for the entire spectrum of hospitality business stakeholders by consolidating up to 10 operational systems into a single, mission-critical platform; including instant team communications, team scheduling overlaid with labor costs, and live sales performance data - providing operators with greatly enhanced profit visibility. TeamLive also features a revolutionary time clock feature with facial recognition, capable of gathering data from individual team members and reducing wage discrepancies. Currently operating in New York, Los Angeles, London, Chicago, Las Vegas, Washington DC, Miami and Orlando, Harri partners with more than 8,000 top hospitality brands ranging from fast casual to upscale, full-service dining. Some of Harri’s partners include CAVA Grill, Nandos Peri Peri, TAO Group, Chef Jose Andrea’s ThinkFoodGroup, Chef Michael White’s Altamarea Group, Chef Andrew Carmelini’s NoHo Hospitality Group and The Savoy Hotel London. Harri is a platform built to help the hospitality industry source, hire, and manage their employees more effectively and efficiently. With Harri’s all-in-one digital platform, employers can find and onboard top talent for their business using media-rich profiles and streamlined tools, all while reducing costs, saving time, and enabling long-term success of teams with best-in-class cloud-based management systems. To date, more than 3,000,000 applications from chefs, bartenders, servers, hostesses, and managers have been submitted to 53,000 jobs posted on Harri. Harri has more than 370,000 members and 8,000 employers spanning the USA and UK markets. It is the number one marketplace for hospitality talent in NYC. For more information, visit harri.com. 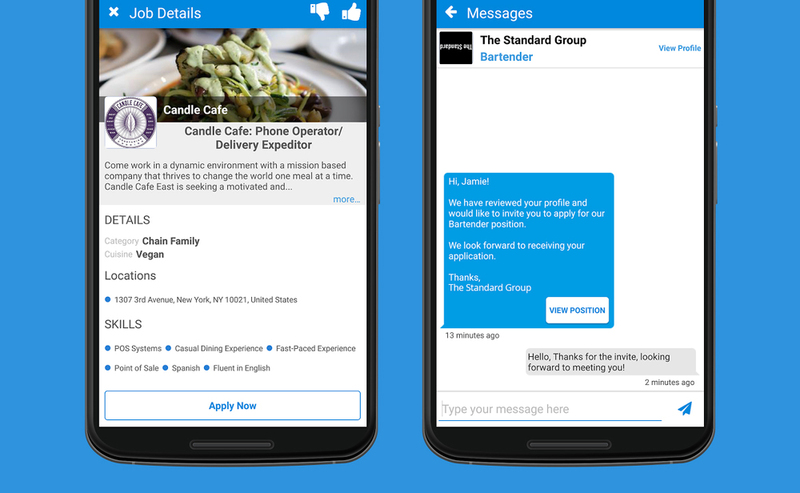 If you're a hospitality professional dedicated to taking the next step in your career on Harri, here's an important factor that will help you stand out from the crowd: your response rate to employers. Oftentimes, hiring managers are in a rush to fill the spot of a server, chef, or manager. If a new employee needs to be hired ASAP, a delayed response can greatly decrease your chances of joining their team. So when you're applying to a job or receive an invitation to apply, it's in your best interest to answer in a timely manner, even if you are not interested in the offer. If you respond within 0-24 hours, you will be rated as Outstanding. Reply back to a hiring manager after 25-48 hours, and you will be rated as Good. Messaging employers 48+ hours will result in a Poor rating. Your score improves or is maintained each time you show up to a job interview. If you accept an invite, but do not attend and inform your interviewer 24 hours in advance, your score will not be effected. For your first no-show offense, you will receive a warning email. A second offense means your profile will be tagged as 'No Show'. Your third offense will lead to the suspension of your account. Fortunately, ratings are not set in stone; you can always work your way back up. To achieve an Outstanding score again, you will need to respond within a day's time for three separate occasions, or successfully attend a job interview. When you communicate to employers (and always make sure to do so professionally), responding as quickly as possible shows that you're punctual and excited about the opportunity. Even if you're not interested in the job, it's always better to politely decline the offer than to not respond at all. It is basic etiquette to show that you are being a true professional. This will not only help you in your career, but also help you stand out on Harri! Login to your Harri account to see your Profile Score now.